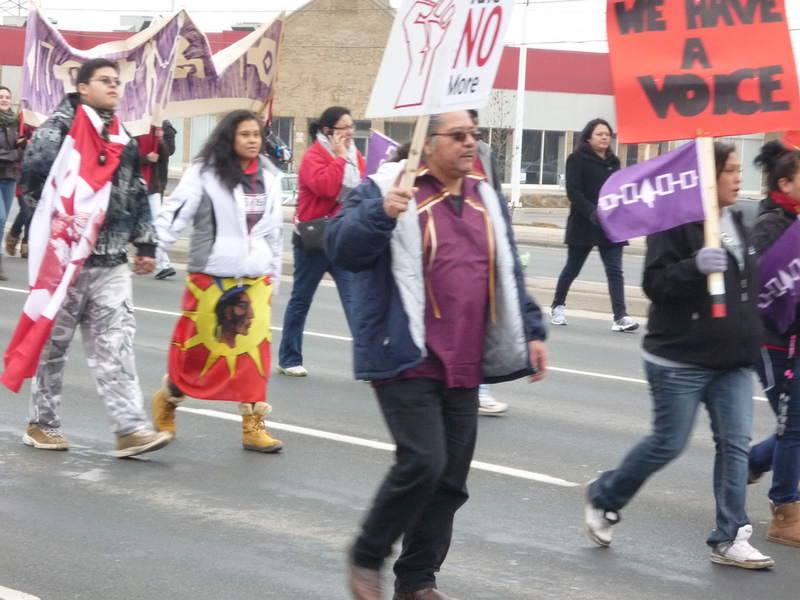 Are you supporting Idle No More? The past week has been a momentous one for Idle No More, a grassroots aboriginal movement working to defend the environment and native peoples’ treaty rights in Canada. Supporters have been taking to the streets and public spaces across Canada to rally against the recent changes to the federal Indian Act, particularly the addition of Bill C-45, a budgetary bill that the campaign says will infringe on Indian Reserve land rights and abate environmental protections. Yesterday, demonstrators in Quebec blockaded a rail line by setting up a campsite on the train tracks, saying they would remain indefinitely. "We’re targeting the cargo rails, the trains which are transporting our resources that were exploited here in our backyard with little or no benefit to our people," a spokesperson for the blockaders told the CBC. The move followed a similar blockade in Sarnia, Ontario that began on Dec. 21, but was taken down earlier today. The movement was launched in October by four women concerned about the upcoming legislation, but the current upsurge began on Dec. 4, when First Nations representatives were barred from the House of Commons, where they planned to voice their concerns. In response, chief of Attawapiskat First Nation Theresa Spence has been on a hunger strike since Dec. 10, subsisting on only fish broth and water for more than three weeks. She’s promised to starve to death unless Prime Minister Stephen Harper meets with First Nation leaders and the Governor General to discuss treaty rights and the country’s relationship with its indigenous people. Dec. 26, in addition to being Boxing Day in Canada, was a major push forward for the campaign.Flash mobs broke out at bustling shopping malls in Calgary, Edmonton, Ragina, Saskatoon and other locations, featuring hundreds of protesters, drums and traditional round dances. In a separate rally, protesters stopped passage on the traffic-heavy Burrard and Robson Streets in Vancouver. Today, Spence and other First Nations leaders are meeting to clarify her demands and push for a resolution. While the Sarnia blockade has been dismantled and Spence’s request has so far gone unanswered, one thing is clear—protesters aren’t quieting down. Rallying has continued across Canada and taken off in the United States, including flash mobs at Mall of America in Minnesota and at Destiny USA mall in New York. Protests have even spread as far as New Zealand and Australia. By every measure, be it respect for treaty and land rights, levels of poverty, average life spans, violence against women and girls, dramatically disproportionate levels of arrest and incarceration or access to government services such as housing, health care, education, water and child protection, indigenous peoples across Canada continue to face a grave human rights crisis.